Sometimes the most frightening experience happens in one’s own mind. This is a theme that often plays out in many horror movies. 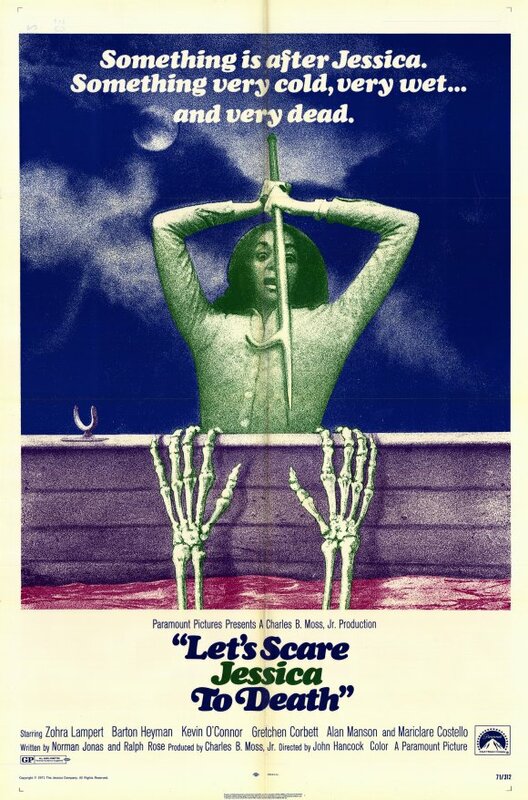 But none has been as effective as the little-known creep-o-drama LET'S SCARE JESSICA TO DEATH (“LSJTD” for short). As LSJTD opens, we are introduced to the title character, Jessica, stunningly played by Zora Lampert. Not much is explained about Jessica other than her release from a psychiatric hospital following an unspecified mental illness. She is still in a delicate state, frequently engaging in conversations with herself over the stability of her reality. We’re pretty sure that she is not ready to come home. In an effort to facilitate her recovery, her husband has purchased the old Bishop farmhouse in a weird, rural community. The town seems to be occupied by only surly elderly men wearing bandages. There are no women in the town, save for a mute girl who occasionally appears and tries to warn Jessica that things just ain’t right. The house itself merits a position within the top ten creepiest horror movie houses. The towering, gothic manse perfectly underscores Jessica’s mental vulnerability. She is no match for the house and what awaits for her inside. Indeed, what awaits inside is a mysterious woman by the name of Emily. Played with brilliantly subdued menace by Mariclare Costello, Emily claims to be a drifter who stayed at the house believing it was abandoned. Her beauty and sensuality quickly charm Jessica’s husband and a male friend. Even Jessica is enamored by Emily and invites her to stay. Emily senses Jessica’s “special” condition and they develop a psychic bond. Though showered with attention by the men, Emily seems to only be truly interested in Jessica. Strange things begin to happen, and we soon learn that all is not right with Emily. She has an alter ego, Abigail Bishop. Abigail mysteriously drowned nearly a hundred years ago in a nearby cove on her wedding day. Her body was never found. According to local legend, Abigail is a wandering vampire who has been sucking the town dry (literally), making the impotent men her pawns. Jessica cannot trust anyone to protect her. The townsfolk are in league with Abigail, and those able to help her are either dead or skeptical of Jessica. She cannot even trust herself. In the movie’s most disturbing scene, Abigail finally emerges from the depths of the lake in her wedding dress, revealing her true self to Jessica. She attempts to take Jessica down in the water with her, even biting her neck. Jessica does eventually escape from Emily, but not without horrible consequences. This movie delivers on many levels. There is a documentary-like feel that only elevates the horror elements. The entire cast turn in strong performances. Their acting feels natural and never forced. Indeed, much is conveyed by what they do not say. From the opening scenes, there is an atmosphere of dread boosted by a haunting and memorable score. The eerie imagery, especially that of Abigail floating in the depths of the cove, made me more frightened of water than any great white shark. This is a fine horror story that could just as easily pass as an allegory for mental illness. Or sociopathic feminism. What is most compelling about LSJTD is the way it keeps you guessing about whether what is happening is real or just imagined by Jessica. On one hand, it plays like a straight forward vampire flick. Key scenes take place outside Jessica’s presence. Emily proclaims that she has been there forever and tells Jessica that she will never leave. She sings a song to Jessica with the words, “stay forever, my love.” A less-subtle sign is her taste for raw, bloody meat. Yet, LSJTD never lets you get too comfortable with such a simplistic interpretation. There is more lurking below the surface. For instance, Emily does not take on vampiric characteristics until after a local shopkeeper tells Jessica about the legend of Abigail Bishop. Similarly, Jessica discovers an antique photograph of Abigail, but does notice her resemblance to Emily until after she suspects her of vampirism. Scenes and events become more surreal the further Jessica unravels. The movie ends as it begins, with Jessica alone in a boat on the water wondering if what she experienced was a real nightmare or a product of her own madness. The death metaphors are equally fascinating. The town is waterlogged and only accessible by a ferry operated by a boatman resembling Charon, the River Styx navigator of Greek mythology. Jessica’s husband drives a hearse and stores an upright bass in a case shaped like a large coffin. Jessica is obsessed with death and even romanticizes it. For instance, she enjoys visiting the local cemetery and hangs macabre gravestone rubbings on the walls of her bedroom, as if to surround herself with death. She eagerly participates in a séance, crying with passion as she tries to summon the spirits of the Bishop house. Yet for all her fascination with death, she goes mad with fright when faced with it. In an attempt to reach a better understanding of this film, I came across an interview with the original screen writer, Lee Kalcheim, on the website letsscarejessicatodeath.net. He originally wrote the screenplay as a satire with the title “It Drinks Hippy Blood.” It was intended to be a story of hippies who are terrorized by a creature in the water that is later killed after being impaled on a pole with an American flag. The director, John Hancock, changed the tone and direction of the movie. With the help of the cast (who came from a background in New York theatre), Hancock turned it into a “serious, darker” film. Kalcheim was so unhappy with the final result that he refused to have his name associated with the film, giving his name as “Norman Jonas” (his father) for the screenwriting credit. So much for that. I first watched this 1971 horror masterpiece when I was 12 years-old on late night TV. What struck me even at that young age were the film’s powerful, eerie atmosphere and the way it kept you guessing whether everything that was happening was “real.” Over 20 years and almost a dozen viewings later, I am no closer to resolving that question. In the end, knowing the answer is not important to enjoying this classic flick.